Avilés - the 3rd most important city of Asturias, Spain. Situated in the estuary of Avilés west of Peñas Cape, it has an important national seaport and important industry. It is close to popular beaches such as Salinas. The area experiences Atlantic, warm summers with both overcast and sunny days. In winter the weather is moderate, with significant rains and wind, although sometimes the cold climate of Asturias results in snowfall at sea level. 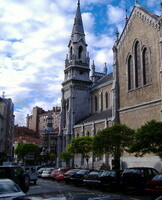 There are many important monuments, like Santo Tomás de Canterbury church and San Nicolás de Bari. There are also civil monuments, like the baroque Palacio de Camposagrado, fortified in its north façade against the English pirates. 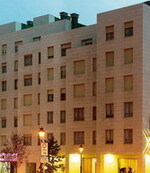 The Hotel Silken Villa de Avilés is a modern property situated within 500 metres of the historic centre of Aviles on the northern coast of Spain. The hotel's El Galeote restaurant serves Spanish dishes and regional specialities within a modern, minimalist setting. The hotel is air-conditioned throughout the public areas and offers breakfast services (fee) and an onsite parking garage. Guests on business can benefit from a choice of three conference rooms and a range of business service; event and banquet catering is also available. Nearby attractions include: the 13th century Sabugo Church, 500 metres from the hotel, and the beach at Salinas, five kilometres away. Asturias Airport is 13 kilometres from the hotel, with an approximate driving time of 12 minutes.